Over the weekend, it was my husband and my 5 year anniversary. 5 years guys! That might not seem like a lot to some people, but to us, it’s a milestone. I never would have thought I could find a man as good as the one I have. 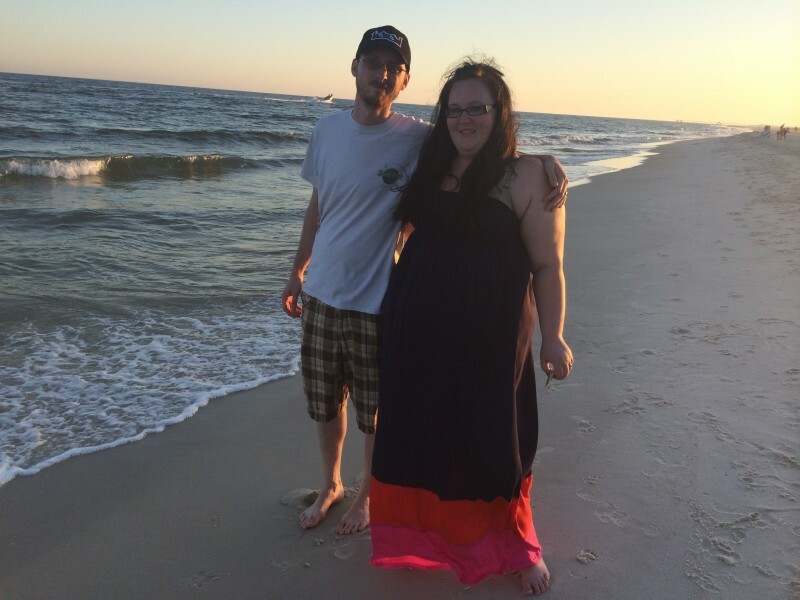 My highschool sweetheart, the best dad to our daughter, and my player 2 for life. So for this holiday season I wanted to show him how much he means to me, and if you are looking to pamper your man this holiday season, I’ve got something for you! Who says men don’t deserve something special and thought out too? It’s not all about new socks and deodorant under the tree right!? How about 12 days of passion to spoil him during the most wonderful time of the year? I decided I would make a gift basket, and a DIY coupon book, 1 coupon for each of the 12 days, along with some must have’s to go with them. First, you need to head to the store to grab everything you need. I personally love shopping at Walmart because I can grab everything I need all in one place. 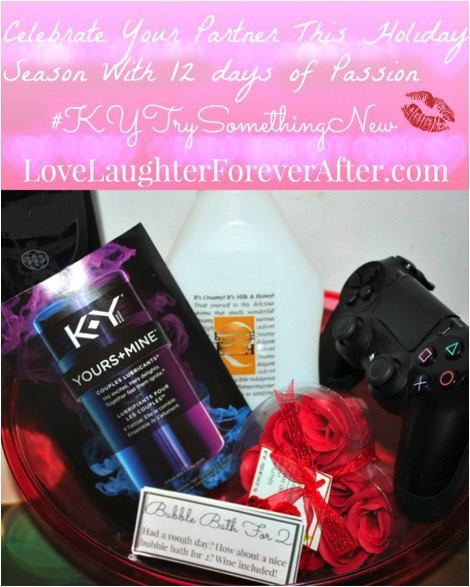 The first thing I wanted to make sure I included in my gift basket was K-Y® Yours+Mine® Couples Lubricants® because nothing says passion like a little fun! I used this $2 off one K-Y® Yours+Mine® Couples Lubricants® coupon as well, because everyone likes saving a little money, especially around the holidays! 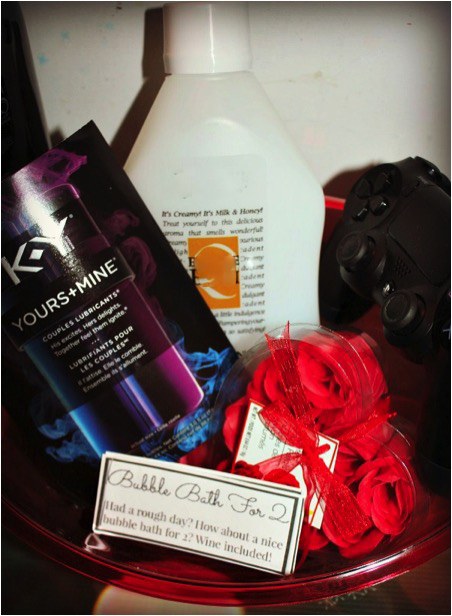 I also grabbed a game controller, some bubble bath, wine, and rose petals (hey, what can I say, I’m a romantic) to add to my basket. Once I got all the things needed for my “Passion Gift Basket” as I call it, I whipped up a cute little coupon book to include. And guess what? I made one for you too! Simply print, cut, and enjoy! 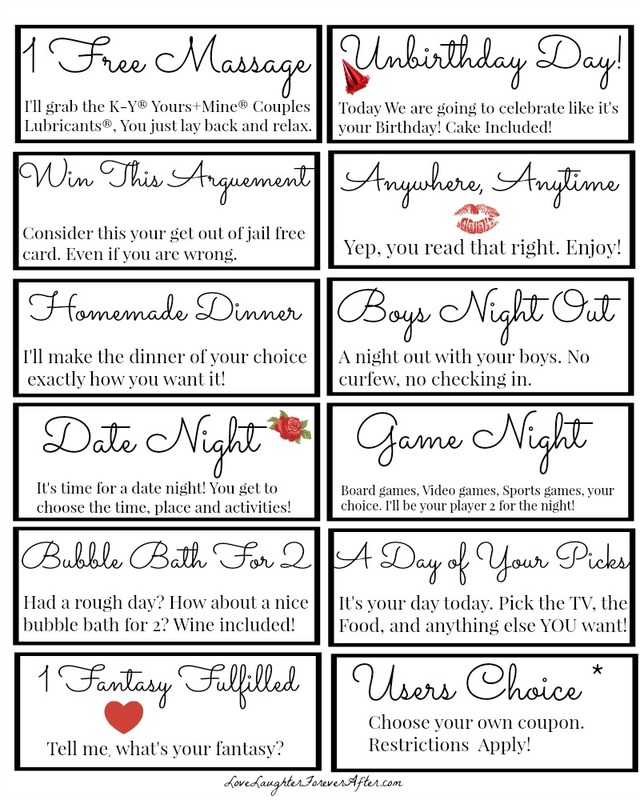 I made sure to add items that were fun for both of us, and would really help us connect during our 12 days of passion. Ok, so you have your gift basket, you have your coupon book, now you have to pick the perfect time to present it! 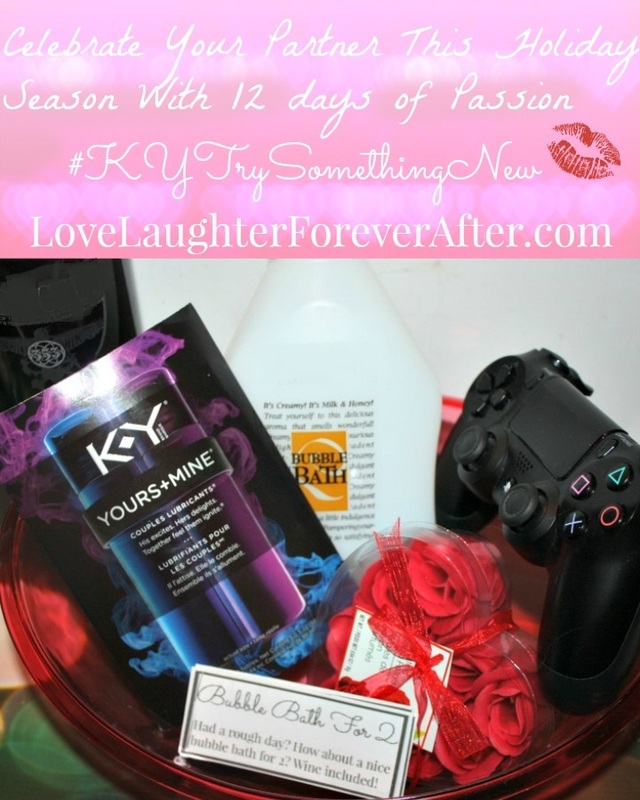 My husband works nights, so I don’t normally see him much on weekdays, but I decided to leave his basket on the table for when he got home, and after he saw it, I peeked around the corner, holding some K-Y® Yours+Mine® Couples Lubricants® and asked if he was ready for his massage. It was perfect! He was so shocked and surprised, and it really made my heart happy to see him so surprised. 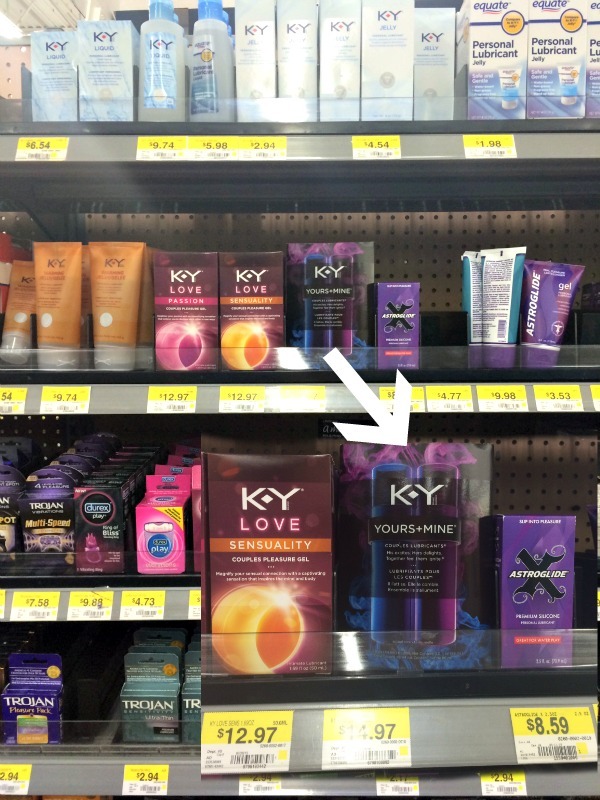 So if you are ready to bring a little passion in to your life, make sure you pick up some K-Y® Yours+Mine® Couples Lubricants® at Walmart and come up with your own 12 days of passion idea (or you can steal mine!). Happy Holidays from us to you! Have you ever used K-Y® Yours+Mine® Couples Lubricants®? What did you think? We tried this not long ago and we liked it. Glad you are having a great holiday season, too. We’ve never used this before, but I’m not ruling it out. I think it might be an awesome experience. Your Users Choice with the Restrictions Apply makes me giggle. Gotta have that Restrictions Apply for sure. Totally a fan of this product… but REALLY love your idea of the gift basket. I’m gonna try it and see if M likes it too! We haven’t tried this, but I have been curious. Maybe we will try it out! 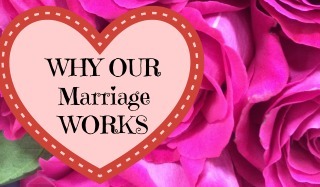 I think this is such a wonderful and important topic! You did a nice job with the pictures also. Haven’t tried this product yet, But your idea of gift basket is so nice. I’m going to check this out and see. all couples need some special alone time. the xbox remote makes me laugh so hard. I love the coupons! That’s always such a fun way to surprise your spouse. What a great idea for uprising your other half. Love the coupon idea. I an going through menopause, so I have some dryness. We use KY to help with that. Sometimes all you need for a little spark is something like that. I’m glad he was happy with the surprise! It is always important to have passion in your relationship and this is such a great way to help kick start that into gear. I used this product before and thought it was pretty fabulous! Husband did too, I’d love to give it as a gift for him in his stocking. I never thought about celebrating the holidays with something like this – best idea! I am totally open to exploring new ways to become more intimate with one another. The lubricant looks like a lot of fun and I love that adorable coupon book too, although not as much as my husband would. Would that be a fun surprise stocking stuffer for that special someone? Probably wrap it up so the kids don’t see it though lol. What a great stocking stuffer idea for the husband. HA! It is important to spice things up when you can. This sounds like a great stocking stuffer for your partner. You have to keep things spicy, and I’ve learned this after 18 years with my man. I know my hubby would be over the moon to get some of those coupons! These are some fantastic, fun ideas! I definitely think that it is so important to make time for your spouse whenever you can. As parents we often get so busy and tired but even just 5 minutes of alone time per day is helpful in maintaining our relationship! Now that’s a stocking stuffer idea. 🙂 I laugh, but it’s really true! Haven’t tried this, yet, but my husband and i love trying out new products. I will look this up. I’m laughing at the “restrictions apply” on the one coupon. I’d have to say that, too! Happy anniversary! I love the K*Y yours and mine! We’ve been using it for awhile now! I love these ideas for the 12 Days of Passion! I would definitely do this for my husband! Thanks for sharing!